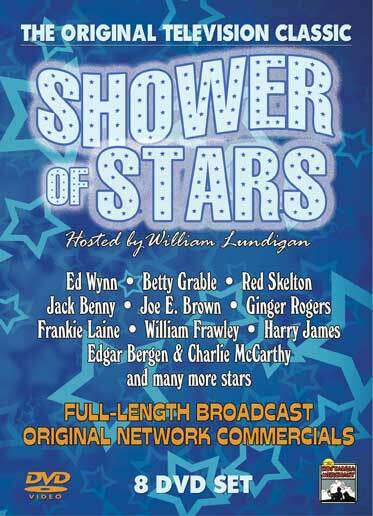 Shower of Stars was a mixture of musical comedy revues with an occasional dramatic play. It aired on an irregular basis during its run (1954-1958), and was designed to contrast with the heavy dramatic content of the program with which it shared its timeslot, Climax! Both programs were sponsored by the Chrysler Corporation, and both were hosted by William Lundigan. Famous entertainers and screen stars appeared on the program. Originally broadcast live in color, these black and white versions are all that survived on film. This collection includes eight full-length shows with the original network commercials for Chrysler. 8 DVD Set. Digitally remastered.